Here is the most exciting thing to happen in Rural Farmville in the past week. 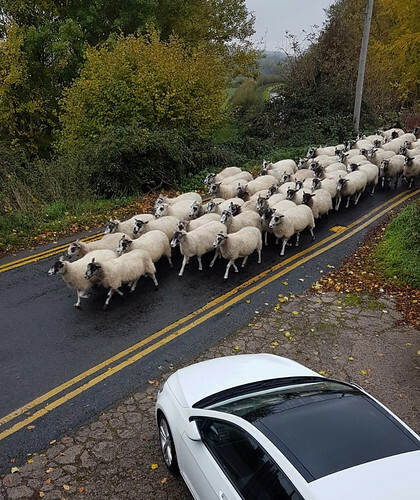 This is probably more sheep than cars we get down our lane in a day. Closely followed by two energetic border collies and a shouty farmer. Ah, country life. This entry was originally posted at https://nanila.dreamwidth.org/1207151.html. The titration count is at .0 pKa. I'm surprised there's not a law against that! There might be, but who's going to enforce it at 10 AM on a Sunday? I see your point. I've rarely known the polis to enforce anything, except when I went to the airport with my camera. Woe betide you if you go to the airport with your camera! We were pretty darn excited about it, heh. Don't count & drive !